This story from Jesus’ life was really about two bent out of shape people. Obviously, we see the woman who was bent over double for eighteen years. But another person was bent-out-of-shape as well…a religious rules keeper. The length of his torment was unknown. Both were crippled and attending this fellowship. One was crippled by a spirit of weakness and the other was crippled by a spirit of legalism and bitterness. Jesus could only help the woman. The man continued on in his crooked condition. Dr. Luke specifically informed us that this woman’s suffering was more than a “medical condition“. Instead of employing a medical word to describe her problem, Luke used the phrase “crippled by a spirit.” Then in verse 12 Jesus also used the word “infirmity“. It’s the word asthenia, which doesn’t mean “sickness caused by disease” but “weakness“. When I was a kid, people used to refer to alcoholics as having a “weakness“. In other words, these otherwise strong people were weak when it came to alcohol. They were weak, when others were strong. About 30-40 years ago, this all changed. Alcoholics were no longer considered “weak”. It was said they had a disease. This also helped because insurance started paying for their treatment. But, in one sense it is disease. The Bible says the sins of the father are passed down 3-4 generations. So, a disease it is. But, these same folks are weak as well. It’s probable this woman’s weakness was caused by some demonic influence because Jesus says in verse 16 she had been “bound by Satan” for eighteen years. Demonic spirits can provoke physical problems, but not every illness or disease is caused by demons. There were twenty-six recorded miracles where Jesus healed someone of a physical problem and only seven of those were caused by demonic influence. This particular encounter became a battle over truth. At some point eighteen years ago, a lying spirit had convinced this poor woman she couldn’t stand up straight any longer. From the language Luke used, it appeared she had no physiological cause for her affliction. When Jesus came along issuing “truth“, it became her opportunity to be set free from her affliction. All spiritual warfare starts in your mind. The mind is ground zero where most spiritual battles are won or lost. Praise the Lord – she believed Jesus’ words, after He touched her. I know you may have heard this story before, but it fits well here. Have you ever seen a circus elephant tied to a small wooden stake outside a circus tent? The grown elephant could easily rip the wooden stake out of the ground. But when elephant handlers are training baby elephants, they use a strong, iron anchor bar and drive it deep into the ground. When the baby elephant tugs and tries to get away, he can’t do it. He experiences the pain of the shackle on his leg. Eventually he gives up and stops pulling. As the elephant grows, they replace the iron bar with a wooden stake. This is why the now grown elephant doesn’t pull away; he doesn’t think he can… so he can’t. It’s not the stake in the ground keeping him in place; it’s the thought in his mind that keeps him there. One of the devil’s greatest tools is to try to erect a stronghold in our mind to make us think we can’t do something God has told us to do. I have a long list of lies about myself which I used to believe. These were all lies the demonic realm tried to use to keep me enslaved. I was no different than the baby elephant. It has taken a lot of scripture and revelation from heaven to pry the demonic junk out of my life. I don’t know of any growing believer who has not had to receive some kind of deliverance from the Lord. It is part of the process. The devil is a liar and the father of lies. It is the lies we continue to believe which enslaves us. It is only as we bring our brokenness to the Lord that He can heal us. We are who God says we are! 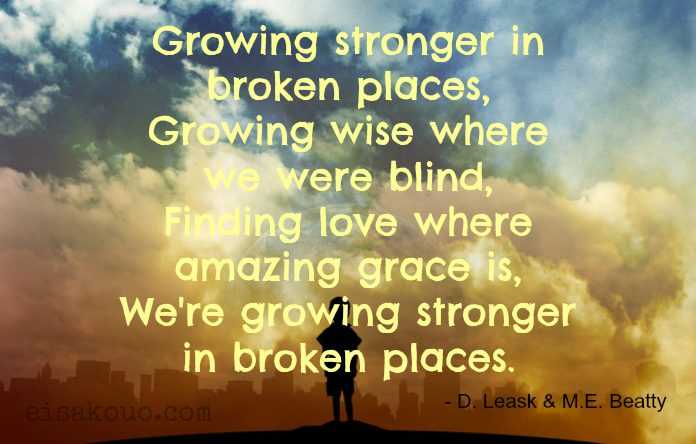 It is only then that we can grow strong in broken places and truly minister to others.